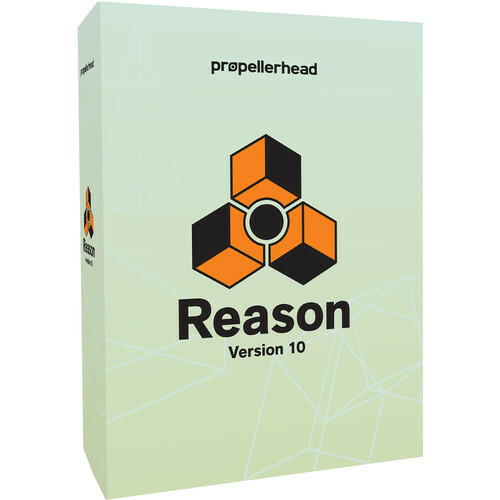 This 10-seat educational version of the music production software Reason 10 from Propellerhead Software is a virtual studio offering synthesizers, samplers, drum machines, and effects, coupled with MIDI & audio tracks, and a dedicated mixer based on the world-class SSL 9000K recording console. Version 10 introduces the Loop Supply and Drum Supply loop/sample sets, the Synchronous effects modulator, and six new virtual instruments, including the Grain and Europa synthesizers, Klang tuned percussion, Pangea world instruments, Humana vocal ensemble, and the Radical Piano premium acoustic piano. The software offers many workflow features including audio-to-MIDI, bounce in place, reverse MIDI, and split notes with the Razor tool. The included Player Devices offer MIDI insert effects including scales & chords, note echo, and the dual arpeggiator. Additionally, the pitch editor allows for high-quality pitch correction from within the sequence window. Reason 10 includes 5000 instrument patches, 1000+ mixing/mastering effects, and over 3000 loops. Users can record to an unlimited number of audio tracks, and record-ready channels can be created in an instant. A composite editor assists in building the perfect track simply by selecting the parts that work and muting the ones that don't. Non-destructive time stretching allows for recording first and picking a tempo later, while non-destructive pitch change is done with a mouse click. The software includes MIDI-out support to bring the sound of hardware synthesizers and beat boxes to the Reason rack. MIDI is handled by an external MIDI instrument device, which is fully integrated into the Reason environment. Automating MIDI equipment from Reason's sequencer or even from control voltages in the Reason rack is very simple to set up. Additionally, the software can automatically slice audio recordings into single notes or hits, for further creative control and to quantize a take, tweak timing to perfection, or drastically change the recording using time stretching. The sliced-up audio can also be converted to REX files for playback and further treatment in Reason's Dr. Octo Rex Loop Player, samplers, or the Kong Drum Designer. A fast and flexible sequencer comes with vector and tempo automation, count-in, multiple lane tracks, and Blocks mode. The floating window provides fast access to detailed editing functions that you may use all the time, such as: quantize, transpose, note velocity, note length and legato. When creating songs, many musicians tend to think of music in terms of intro, verse, chorus, breakdown, and buildup, etc. With Blocks mode, the sequencer allows the sequencing of songs using a pattern-based approach, with the segments of the song laid out in an arrangement as individual building blocks. The ReGroove Mixer is a real-time, non-destructive groove management device that can lock all the tracks together into one unified feel, and allows you to apply different settings to create up to thirty-two musical elements in a song. Rack extensions open up the Reason rack to third-party developers. While not a new plug-in format, they function in a similar manner in that they "plug-in" to the rack, but retain the same hierarchy as any other Reason component. Load them into Combinator, route cables on the back, automate all parameters, and experiment with the safety of undo. Scales & chords: transposes incoming notes to fit a set scale, or transposes notes and generates chords that fit the desired scale. Scales & chords has a number of built-in preset scales, and you can also create your own custom scales. Reverse MIDI and automation: reverse note (and automation) clips and events. For example, play the events of the clip “backwards” (from the end to the start). The Softube Guitar Amp and Softube Bass Amp are amplifier and speaker cabinet simulators based on the renowned modelling algorithms developed by Softube. The two devices feature accurate simulations of some of the most coveted vintage amplifier and cabinet models, that you can freely mix and match. Box Dimensions (LxWxH) 7.9 x 5.9 x 2.5"